In 1921 Mickey’s grandparents (Nana and Grandy) came to this area for their honeymoon. It took them 4 days to drive the winding two lane roads from Savannah to Nantahala in a Model T. They spent their honeymoon at what is now the Nantahala Village and returned often for vacations. After the birth of their first grandchild (Mickey) they decided to buy property in this area. 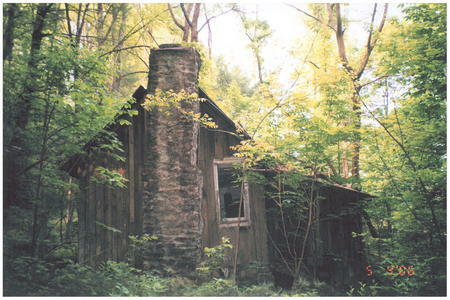 In 1952 they purchased a retired apple orchard that included two old cabins, the remains of an older homestead and a barn. Mickey and his family made frequent trips to the cabin and they spent their summers there. Mickey eventually purchased the property from his grandparents. The “old property” was very remote and the long, steep road leading to it was impossible to maintain without living there full time. No one from our family could get to the old cabin unless we were around to 4-wheel them up the road ourselves. We have many memories of using the chain saw and winch to get to the cabin. We decided to look for another special place in the area that provided easier year round access. We were fortunate to find this property on the river and we decided to sell the other property. A condition of the sale was that we retained ownership of the wood contained in the cabins and barn and we also retained ownership of the old homestead chimney. With the help of a few local friends, we transported the chimney stones down the mountain and to this location. We tore down and saved the wood from the cabins and barn. We were very surprised that the cabins were even older than we had thought. We discovered they were originally built as one room cabins and were built with chestnut wood. A good friend removed the nails from the wood and he stored it for us until we could make arrangements to transport it to our home in Savannah. We had not intended to build on this property immediately, but the possibility of building code changes forced us to build sooner rather than later. We worked diligently to clean the wood, dry stack the wood, measure and catalog the wood, etc. We made the decision to use this antique wood in the Lodge. The floors, ceilings and furniture are heartwarming and amazing. When we purchased this property we felt a huge responsibility to build a house that fit in with the beauty of the Nantahala Gorge. We wanted to use local materials and local craftsmen. We were extremely fortunate to find the right people to help us bring our dream cabin to life. Everyone that helped us build the Lodge had a great love of the area and they helped us build with as little impact to the land as possible. You will find many things at the Lodge that we brought from the old cabin. The black wood stove was used to heat our cabin, the oven door came from the old Dixie stove, the state plates came from Nana’s extensive collection, the farm tools and barn doors came straight from the old barn. These items are now artwork that share our family history. Mickey built the dining table & benches, coffee table, master bedroom headboard and the mantle from the wood we saved. We are thankful we have local families helping us care for our Lodge and property. Their care and continued attention to detail help us maintain what we worked so hard to build. We love Nantahala and the awesome river and especially enjoy the uniqueness of the Nantahala Gorge each season. We are very happy that we can share this special place with you. We hope that you leave here with a little magic and wonder in your soul.